Many small companies fail to ensure that each department supports the others. Surprising, since it should be second nature. But we often fail to explain clearly to team members, just what is wanted of them and how they are needed to interact with one another without putting barriers in front of our colleagues. What are cross functional communications? They are the ways in which the various departments in your factory interact with one another. And do not think that the organisation chart fully details where the power lies! You might be surprised. I don’t have the time to think about all this! You don’t have to; that’s where we come in. 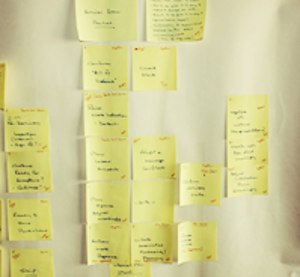 Process mapping employs a very simple solution – your staff, our advisers and that good friend the Post-It Note. None of my staff has experience of the things you’re describing. No problem. We will provide a training programme for whichever members of staff are judged to be likely to benefit from such development. We have coaches, mentors and trainers ready to help. We often find that with the arrival of management systems, the demand for standard documentation increases: SOPs – Standard Operating Procedures, WIs – Work Instructions, AOIs – Additional Operator Instructions, are all QC related method control mechanisms which indicate to auditors that repeatable protocols are followed by staff which contribute to the consistency of output.